Papa Bear Lodge is conveniently located in Pigeon Forge close to Dollywood, Splash Country, the Tanger Outlets or specialty shops in downtown... VIEW NOW. Aunt Bug's staff were extremely helpful throughout the process and answering questions. We travel to pigeon forge or gatlinburg at least once a year for the last 10 years and this is our favorite cabin yet. The cabin was unbelievable! Spotless , beautiful, great views and a great location. We had a wonderful time and want to stay in same cabin next time. Only complaint was that we stayed 4 nights and were not given any extra toilet paper rolls. Everything else was great! Good experience with the trip and stay. Great stay with Aunt Bugs Cabins. Very clean.. trash was full outside the whole stay but they probably only do pick ups once a week. Other than that.. no problems. And we will be BACK! Everything was perfect during our stay. If I could recommend one thing.... would be more comfy beds....but other than that we would for sure return. Nice cabin. Clean. Only problem was had a late checkout but the housekeeping shows up early anyway. Had a great stay with a full house but still felt like we had plenty of room. Staff replaced propane easily when ours was empty. Would stay here again in heartbeat. (6 or 7 steps) to get to the main level! The incline was another option that was not a plus for us, but I did not know to question that as n was so very glad to find the bedroom.bathroom issues. I have a few suggestions to make it a little better for everyone: (1) small tables, or tree stumps, or flat piece of wood on the railing by the rockers to set your drink or coffee down (2) Make a Word Document on bright card stock to post on the refrigerator of all important phone #'s, such as Office, After Hours Emergency, 911 if there is that service in the mountain (3) Also include the physical address of the cabin on this sheet so that it could be pout in the GPS. We "lost" the hand drawn map that we received at checkout and we had to call the office on our way home one evening! I'm sure this physical address was furnished in the material I received, but I did not remember. It was a great time and a lovely facility. I will definitely book again but k now now some additional questions to ask! We loved how convenient the cabin was to Pigeon Forge. It was a cute, little cabin. It was clean. The beds were hard as a rock. The view was not as pretty as I had hoped it would be, but other than that, a great place to stay! Nice and clean cabin. Wish there had been more bath towels,only 6 towels for 9 people so I had to do laundry a few times....glad there was a washer and dryer in the cabin! Over all it was good and we would do it again. The view from our cabin was simply breath taking...overlooking the Smokies, it was extremely relaxing. we sat on the deck and just enjoyed the view, each evening we sat in the hot tub, refreshment and all and just listened to the outdoors. The people who work for Aunt Bugs couldn't be more accommodating. I wish the drive wasn't so far, I would love to come back in the fall for the changing of the seasons. This vacation home was exactly what we expected. It had beautiful views but it wasn't a difficult drive up the mountains. It was close enough to the parkway to get there quickly but but far enough to escape it for peace & quiet too! Our family thoroughly enjoy the pool table, air hockey table & arcade game. Really, it was just perfect. 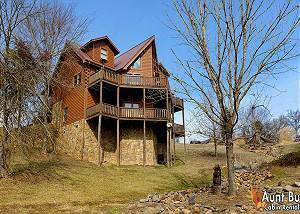 We really enjoyed our stay in the Smokies and Bear Hug was the perfect cabin for our family. The kids loved the loft with all its games and the indoor/outdoor pools and our hot tub were very clean. The rooms and furniture are even nicer in person than in the photos. It was beautiful and comfortable--we can't wait to come back for a longer stay! My only minor complaints were a lack of warm blankets (only 3 provided) and that the sofa beds were very uncomfortable (the springs were sagging and could be felt through the thin mattresses). Otherwise, we thoroughly enjoyed our stay. The cabin was not far from town so there was easy access to all the amenities. Also, Amanda in the office was super nice and helpful. Just be sure to call the office for directions and do NOT use mapquest--you will get lost! We rented bear hug cabin in the bear creek crossing resort. Everything was great and what i expected. I would stay there again. We were pleased with the cabin. We wanted a cabin that looked like a cabin and this one did. We really liked the game room. The arcade game was great. We chose this property because of access to the indoor pool. We were very satisfied overall. The only complaint we really had was that there weren't any extra blankets. Our kids did bring a couple of blankets but we really needed more. Also there was only one set of sheets provided for two pullout beds. We wanted a place that we could just stay in and have fun and this cabin provided it. Friends who stayed at another location were jealous. Thought it would have been a bit bigger, but it was still great. A beautiful family fun cabin!!! Beds were a little hard, but so not a big deal! We loved our cabin!!! We always love staying in the cabins. The location was great. Easy to get to all the spots we visited. Loved the game room upstairs and enjoyed the hot tube after a long day. Never used the pool but we did have a lot of fun playing putt-putt. The house over all was great! The only negative comment I would have was that the mattresses were hard but no bed is like your own bed. This would not stop me from wanting to stay there again. Bear Hugs was a great cabin. Very roomy and a great view. We didn't get to use the hot tub but the jacuzzi tub inside was marvelous. Very close to Pigeon Forge. The beds were very comfortable. The only downside was the lack of interior insulation between the bedrooms, if you get my drift. We would definitely stay again. Easy to communicate. Love the express check-in. Cabin was clean. Easy reservation process. Check-in was pleasant; the cabin was very nice; we were very pleased that the swimming pools were operational at Bear Creek Crossing Resort - the grandchildren loved swimming! Thank you for an enjoyable stay! We loved our cabin. The only issue that we had was someone that stayed in the cabin before us threw up on the rug. When we called and reported it, house keeping was sent out and cleaned the floor and rug. The cabin was neat and clean. Very spacious and well furnished. We experienced two issues, the pull out sofa upstairs did not operate and the plug in the master bath did not operate. Otherwise,’we had a good visit. Cabin was very clean and comfortable! Our family truly enjoyed staying with ya'll! We will be back! The place is very nice and served us well. The unit can use a good cleaning in a few areas. Under the rim of the toilet, YUCK. The toilet in the rear bedroom is leaking on the floor. The washing machine smells. The ceiling fans, ceiling lights have lots o dust. The tops of the kitchen cabinets have a few hundred dead ladybugs. A couple other suggestions would be ceiling fans in the two bedrooms and the air hockey game does not blow air up through the table, so the puck stops at times. A few simple things would go along way making the cabin a nicer place to enjoy. The only complaint I got is the letter I left on the table Regular door lock front and back couldn't lock,one eye on stove didn't work, light in fridge didn't work,Arcade machine didn't work,bathroom sink had no stoppers stuff that I think cleaning crew should have noticed. As always, very good. Had some outside broken rockers (left by early guests) and they were repaired in a very short time. Always accommodating to our needs. It was very nice but the power went out and we able to enjoy or last nite in the cabin we had to go out in the rain .. I had a wonderful experience at the cabin. The view was beautiful and checking in was smooth and easy. Loved the cabin. The hot tub was great. The only thing I would change is letting us know in advance that it was multiple cabins in the area. We wanted something a bit more secluded. Check in was easy. No problems with our cabin other than the beds being hard as a rock. Easy check out. Beautiful place, awesome view! (Just need comfortable beds...eek). But would stay again. ..and again. ..and again! Easy fast check in. Clean cabin. Good location. Will stay again. Our experience was wonderful!!! The cabin was clean and amazing!!! We will be staying again!!! Friendly service, the cabin and views were truly breath taking! Fantastic getaway and will definitely look at another cabin rental in the future! Great cabin! Loved all the games upstairs! Also loved the nice community that the cabin was in!! We arrived after work hours and we had no problems in getting our key. We loved our short stay and will stay here again in the future. Awesome. This was our first time in a cabin.Kiddos want to come back for Christmas. We felt very welcome. We were late arrivals but we received great instructions. Although I didn't have much interaction with you all once I picked the cabin, the short time it took me to check in gave me the impression that if I needed anything, you all would be happy to help.